Thanks for stopping by! Whether this is the first time you’ve ever visited my blog or you’re a regular reader, I appreciate your visit. I started blogging here at Homespun by Laura in 2012 so I could share my projects with others. I’m slowly transforming the 1980s house we bought in 2009 into a home one DIY project at a time. Fresh paint on the walls, DIY decor projects, and rehabbed furniture from thrift stores and roadsides have helped to transform it into a comfortable and inviting space. Other interests include decorating tasty cakes for friends and family, trying my hand at drawing and painting occasionally after about a 20-year hiatus, and running. 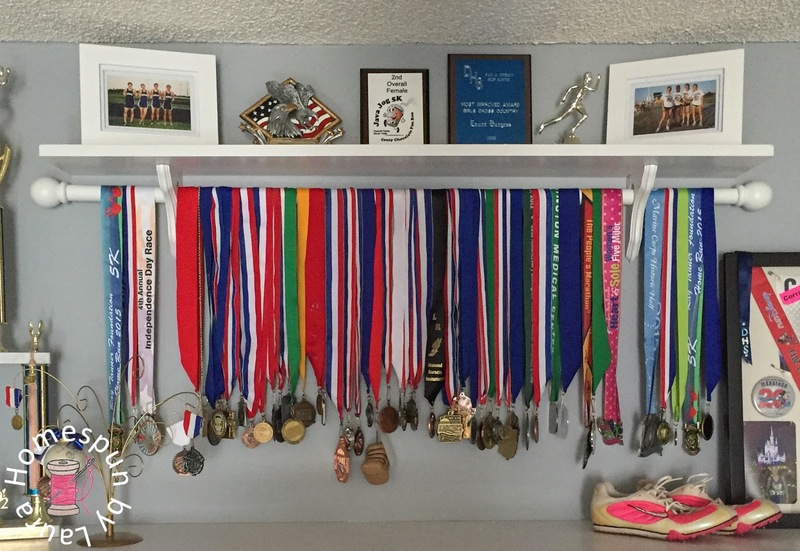 Running is still a huge part of my life. Over the past 18 years (how is that possible? ), I have completed three marathons and more 5k, 10k, and half marathons than I can count. On multiple occasions during a training run, I have found roadside treasures that I’ve brought home and made my own (read about my favorite roadside find here). Other interests include listening to cast commentary and other special features on DVDs (which I often do while I sew or paint), listening to audiobooks, catching a glimpse of a beautiful sunset or sunrise, cooking, and taking backroads road trips with the Mister. In 2016, we hit the road for three months, traveling to all 48 continental states on back roads. Here’s a shot from a backroads roadtrip near the SC-Georgia border. You miss sights like this if you always travel on the interstate! Thanks for stopping by and spending a while in my little corner of the internet! I hope you’ll enjoy reading about my DIY decorating adventures. To receive an email when new posts are published, please subscribe here. Follow me on social media pages for behind-the scenes photos of progress on blog projects, small endeavors that don’t appear on the blog, scenes from our travels, and of course – more pictures of our four-legged friends doing cute stuff.